Hoefnagels, Anna. "Powwow Music". The Canadian Encyclopedia, 16 January 2017, Historica Canada. https://www.thecanadianencyclopedia.ca/en/article/powwowmusic. Accessed 22 April 2019. Music is a central feature at powwows, as all powwow activities revolve around the beat of the drum and the sounds of the singers’ voices. The music is generated by groups of musicians, known as drum groups or Drums, who take turns performing songs, accompanying themselves on a large hand-made drum. The musicians may be placed at the centre of the dance area, or off to one side, but the drumbeat radiates throughout the powwow grounds, giving a distinct sonic dimension to this important gathering. Most powwows have a number of drum groups participating in the event, including an invited host drum and other Drums that travel to the powwow. The Drums take turns performing songs for the dancers. The host drum is a highly respected drum group that is responsible for ensuring that appropriate songs are sung for important activities at the powwow, including the Grand Entry, the Flag Song and Veteran’s Song. They also usually perform specifically requested honour songs and healing songs. Each drum group has its own name with a core membership made up of family and friends. Most often, groups are comprised of male singers who strike the drum in unison, sometimes accompanied with female back-up singers, who stand behind the men. While these gender restrictions are looser in some parts of Canada—with the existence of mixed-gender Drums or all-women’s drum groups—these separate roles are common across First Nations. 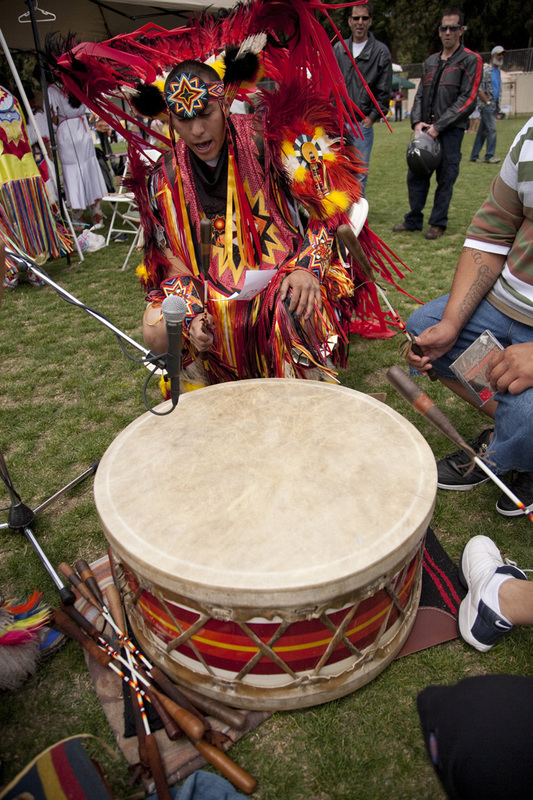 At some competition powwows, drum groups may compete with one another for prize money, with the criteria for evaluation based on musical features (e.g., quality of the song, its execution and appropriateness to the dance) or on extra-musical features (e.g., keeping the drum area clean and being ready to perform when it is their turn). For the members of the drum group, participating in powwow music making reinforces their pride as Indigenous musicians and it fosters a lifestyle that celebrates tradition and living a good life. The musicians often play a handmade drum, made with a wooden frame and an animal hide as the skin of the drum, usually attached with sinew or long leather straps; rarer is the use of commercial bass drums. The drum may be decorated with a painted image or other ornamentation. The drums are struck in unison with “beaters,” which are drumsticks that are often constructed of a fibreglass rod with a leather covering and a leather handle. The drumsticks usually match one another and are transported in a cloth bag with the drum stand; together, the items of the drum are transported and treated with great respect. Along with the decoration of the drum itself, the drumsticks and drum stand contribute to the identity of the Drum. Although there is regional variation in powwow song performance style, there are two main classifications: Northern Style and Southern Style. The majority of drum groups in Canada perform Northern Style music, which is primarily characterized by a higher vocal range for the singers than Southern Style. Further variation distinguishes drum groups from Québec and Eastern Canada with those from central Canada (Ontario) and Western Canada (the Prairie provinces), including differences in text enunciation, intensity of singing voices and the performance of nation-specific music that is not necessarily in the style of powwow music. For example, the Haudenosaunee Smoke Dance is performed specifically at powwows in southwestern Québec and southern Ontario, and it involves the performance of songs by a solo singer striking a hand-held water drum. Although some nation-specific music might be performed at a powwow, the main music heard at these gatherings is intertribal powwow music, which is said to have its origins among Indigenous peoples in the Plains region of North America (see Indigenous Peoples: Plains; History of Powwows). 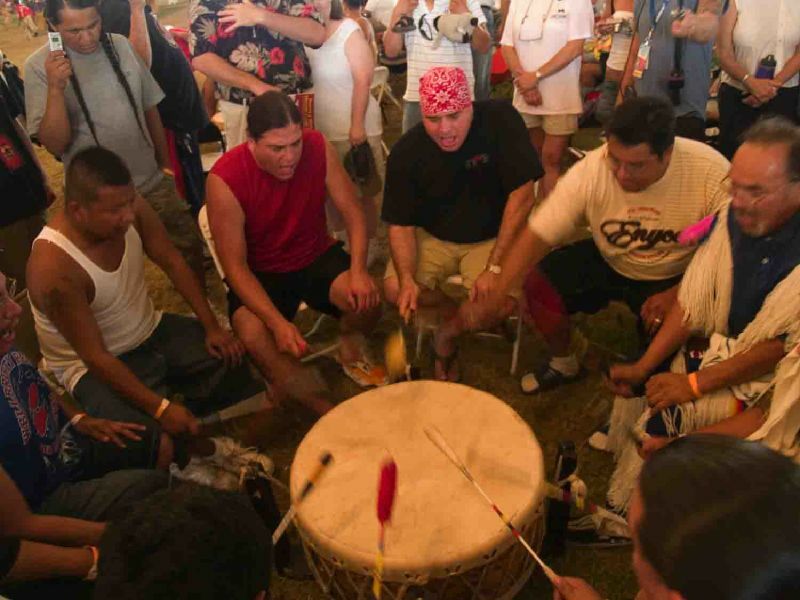 There are many common features to powwow music, which allows for some generalizations. For example, most powwow songs follow a somewhat fixed structure, which is often described as “incomplete repetition.” In this form, the song starts with the drummers synchronizing their drumbeat to sound as one, and once the beat is established, the opening line of the song is sung solo by the lead singer. This is followed by a repetition of that opening phrase by the rest of the group, and then all of the singers continue singing the song, before repeating it, usually at least three more times for a total of four song repetitions. Each repetition is often referred to as a “push-up.” In some cases a “tail,” or coda, is added at the end of the song, which is comprised of the last phrase of the song. The songs are typically sung four times to reflect the symbolism of the number four to many Indigenous beliefs, representing the four sacred plants, four directions, four colours of the medicine wheel and the like. 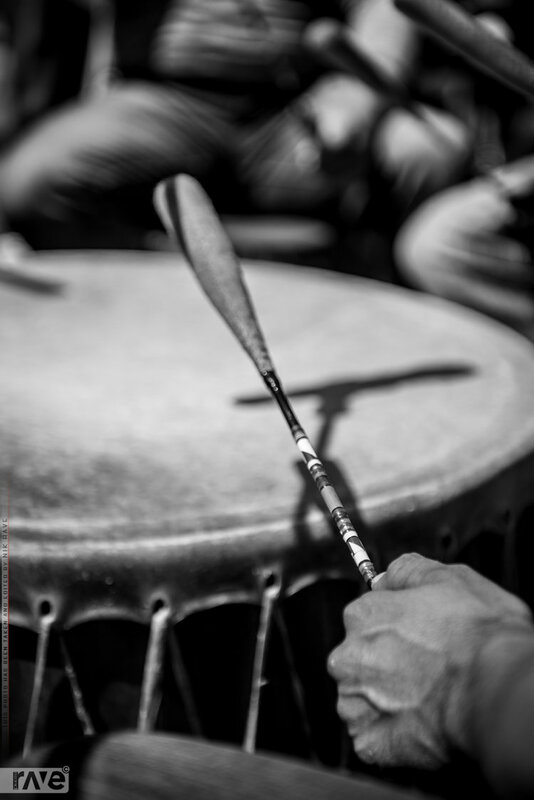 There are a few common drumming patterns used in powwow music that accompany specific dance styles and patterns, including an even drum beat, a long-short (or “heart-beat” pattern) and, for specific songs, an alternation between even drumming and a tremolo, or quick, free striking of the drum, often for men’s sneak-up dances or trick dances. At specific points within many songs, accents may be added to the drumming pattern. These accents can serve to bring the drummers back into sync with one another or to cue a change in dynamics, but they also serve a spiritual dimension. 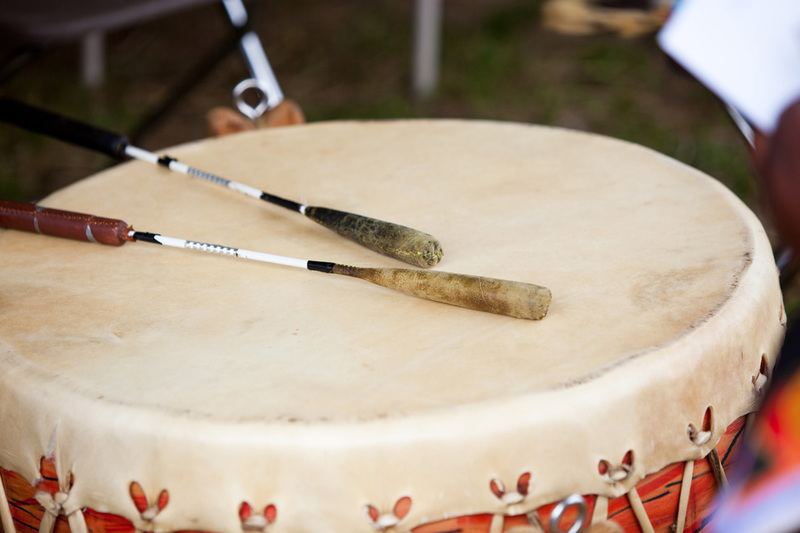 Known as “honour beats,” these accents serve an honouring purpose, in that the drummers acknowledge the Creator and the dancers, and the dancers respond to the honour beats by acknowledging the drummers and the Creator. The style of singing associated with powwow music has been described in various ways, including falsetto and having a strained quality to it. Songs generally start in the extreme upper range of the singers’ voices, and since they sing very loudly, the sound of the singing is quite distinct. Singers may also add pulsations on longer notes, or their voices may “drop-off” at the ends of phrases. Most powwow song melodies are characterized by an overall descending contour, moving from the highest to the lower range of the musicians’ voices (see Powwow Singers). There are two main distinctions of songs according to their texts: “original” songs are comprised entirely of vocables; and “contemporary” songs incorporate English and/or an Indigenous language, with vocables added at the ends of phrases or that alternate between text and vocables. Singers may add extra sounds, such as whoops or ululations to show their enthusiasm for the song and their performance. In learning new songs, protocol often requires musicians to learn the song’s text and vocable patterns, as well as the song’s teachings, including the origins of the songs, and its meanings and purposes (e.g., which dance it accompanies). Songs are typically passed on orally, from one musician to another, but with modern technology, including accessible recording devices and the internet, song transmission is also accomplished through electronic means. Many songs performed at a powwow have spiritual or social meanings for participants, reinforcing important cultural values and teachings. For example, the Veterans’ Song acknowledges the role of warriors and veterans in protecting communities and fighting for freedoms, while also continuing pre-contact traditions of singing to recount war exploits or preparing for battle (see Indigenous Peoples and the World Wars). Healing Songs are performed upon request, often to offer prayers to a sick family or community member. Flag Songs serve as a kind of “national anthem” for the hosting community or nation, and Honour Songs pay tribute to an individual and his/her contribution to the community. 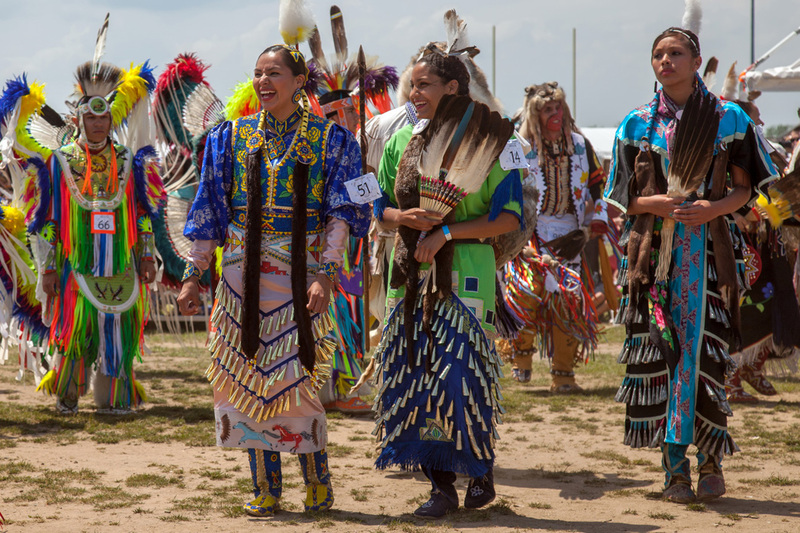 The Grand Entry is the visually stunning opening of the powwow activities, and Grand Entry songs are performed to accompany the entrance of the dancers to the dance arena. Songs are often named for their purpose (e.g., “Grand Entry Song,” “Intertribal Song”), but some are given titles that reflect their meanings or the lyrics of the song. Some songs are interchangeable, in that the same song can be used to accompany different dance types, as long as the drumbeat and tempo of the song suit the dance. 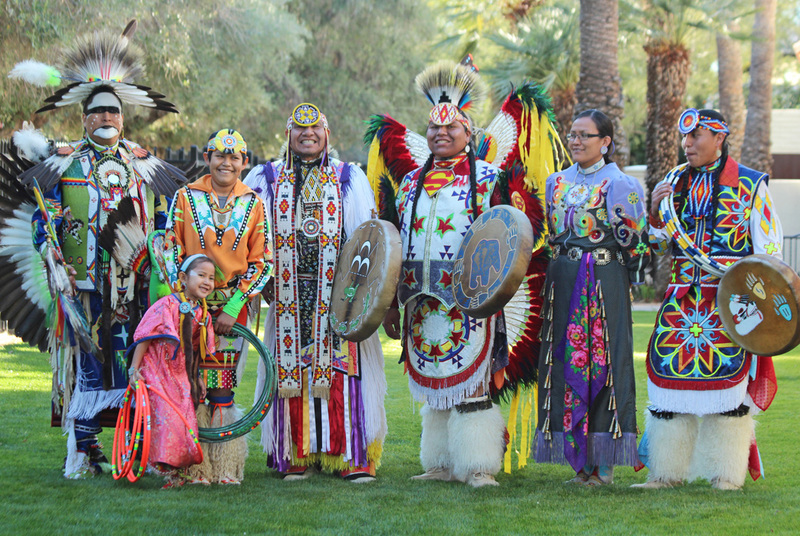 A group of Aboriginal dancers at the Heard Museum of Native Cultures and Art, Phoenix, Arizona, USA. The Heard hosts the annual World Championship Hoop Dance Contest. 11 January 2013. Ohsweken, Ontario, 27 July 2008. 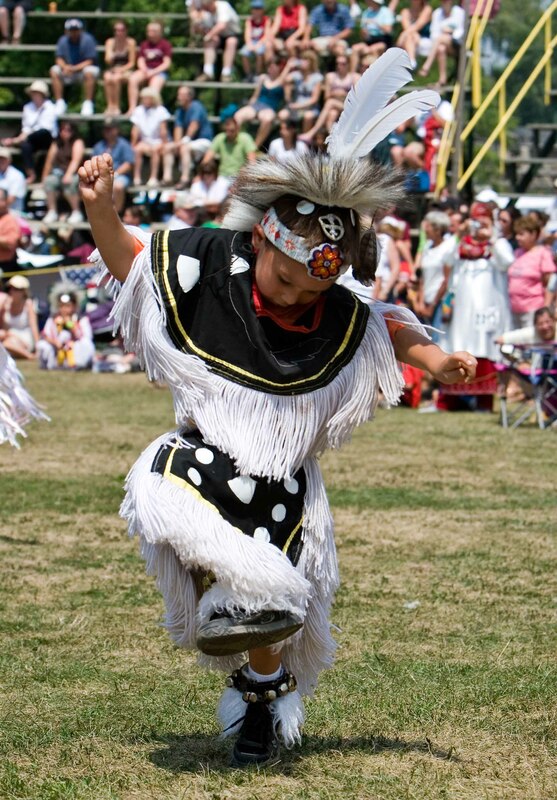 A young Grass Dancer performs during the Grand River Champion of Champions Powwow. Aboriginal women dancers in full dress regalia during the Odawa Powwow festival at Ottawa Municipal Campground in Ottawa, Ontario, Canada, 28 May 2011. The dancers, who are often the most visually spectacular feature of the powwow, move their bodies in response to the drumbeat, circling around the dance area with individual interpretations of their category of dance (e.g., women’s and men’s Traditional Dance, women’s and men’s Fancy Dance, women’s Jingle Dress Dance and men’s Grass Dance). Around the dance area is the audience, and behind them, the vendors (and possibly a camping area). (See Powwow Dances). The dancers largely take their cue from the music. For Tiny Tot dances, which are meant for very young children, the songs may be repeated only two times to allow for a shorter performance by the dancers. Social and non-competitive dances or special activities, such as a Healing Song, may require more than four repetitions to accompany the ceremonial aspect of the song. Songs may also be extended beyond four repetitions in response to the sounding of eagle whistles or fanning by the dancers, two gestures that indicate the enjoyment of the song and a desire for its continuation. Indeed, these gestures of appreciation can also have symbolic and spiritual connotations for participants, and at times, the dancers may discontinue their movement around the dance area and dance in place facing the drum group until the song draws to a close. Tara Browner, “Making and Singing Pow-wow Songs: Text, Form, and the Significance of Culture-based Analysis,” Ethnnomusicology vol. 44, no. 2 (2000): 214–33. 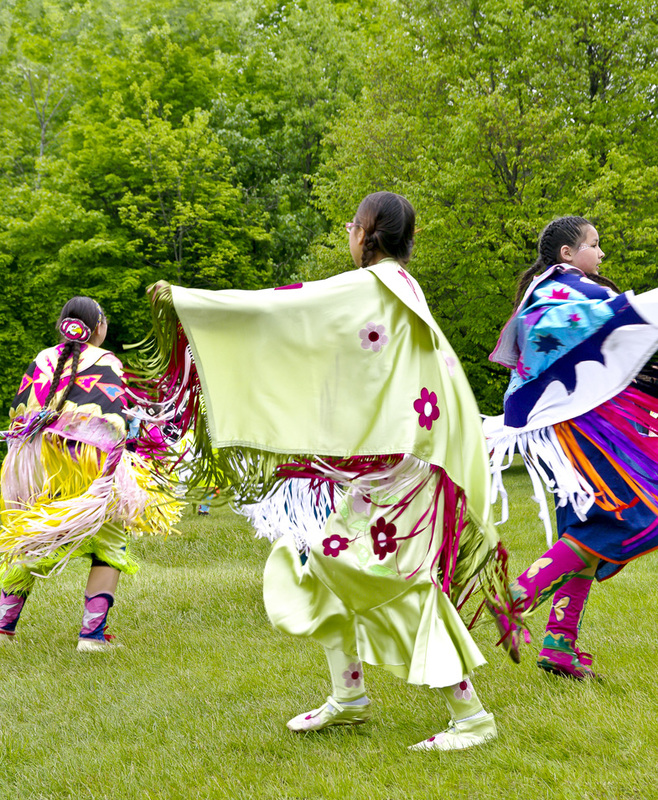 “Top 5 Songs to Get You in the Mood for the Powwow Trail,” CBC, http://music.cbc.ca/#!/blogs/2012/7/Top-5-songs-to-get-you-in-the-mood-for-the-powwow-trail. Anna Hoefnagels, “Northern Style Powwow Music: Musical Features and Meanings,” Canadian Journal for Traditional Music/Revue de musique folklorique canadienne vol. 31 (2004): 10–23. William K. Powers, War Dance: Plains Indian Musical Performance (Tucson, AZ: University of Arizona Press, 1990).